Pro Express Total Auto, extremely fast and efficient Ironing with one touch settings! 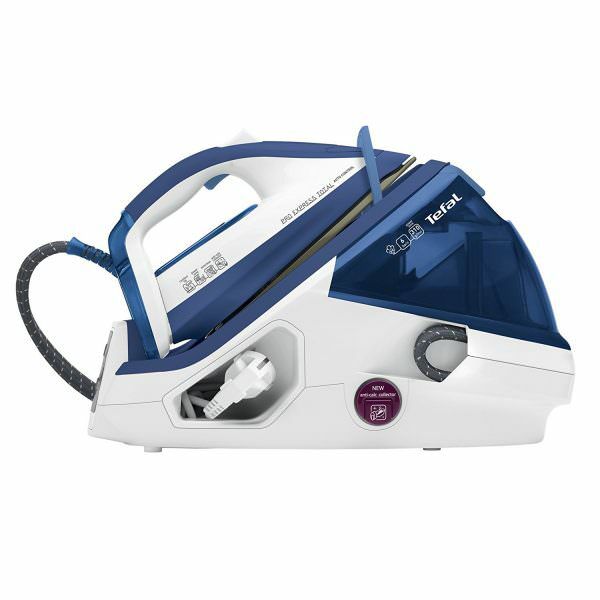 Tefal introduces Smart Technology, a steam generator technology designed to save time and remove the hassle from ironing while still providing the excellent results expected of a Tefal steam generator. With one-touch settings and clever technology, Tefal have ensured that the Smart Technology range will provide the optimal balance of steam and heat, essential for achieving a crisp, crease free finish across all ironable fabrics, from delicate silk to stubborn denim. Want to cut your ironing time? With 6 bars of pressure and a 340 g/min steam boost, the Pro Express Total Auto has enough power to blast through even the most stubborn creases with ease. Three Straight Forward Settings: Ironing couldn’t be easier! No more complicated dials and controls. The Pro Express Total Auto Steam Generator features 3 pre-set ironing levels; Normal, Delicate and Jeans - A range of temperatures required to tackle all types of fabric while still being quick, easy and hassle free to use. Premium Self Cleaning Soleplate With a Superior Glide: The Glide Protect Autoclean soleplate not only makes ironing a breeze but it also cleans itself, helping to minimise the chance of marks on your clothes. It also features a precision shaped tip for those hard to reach areas like in pockets and around buttons. Ultra Long-Lasting Steam Performance: Tefal’s Unique Anti-Calc collector provides the easiest way to deal with hard water and extend the life of your Tefal Steam Generator. Simply remove the spoon and tap out the scale - no rinsing or descaling tablets required. Thanks to this steam generator’s safety lock system the iron is securely attached to the base for easy and safe transportation and storage. Also features an Auto-cord Rewinder and steam hose storage compartment. For added safety and peace of mind, the GV8960 will turn off automatically if left unattended.